Juice is the aqueous liquid, purée of the edible portions, or any concentrates of such liquid or puree from one or more fruits or vegetables . Fruit juices are used for their nutritional value, refreshing nature and for their medicinal importance . Fruit and vegetable juices play role in detoxification of human body and also have a great role in improvement of blood lipid profile in patients of hyper-cholesterolemia . These juices are used unpasteurized in routine [4-6]. Unpasteurized juices prepared by street vendors are more appealing for consumers due to its fresh flavor . Pathogenic microbes may enter in fruits during their growth and harvesting through damaged surfaces and punctures. Juices may be contaminated with microbes from raw material, juice machine, handler and unhygienic conditions . Huge bacterial load of total coliform, faecal coliform,Staphylococcal spp. and Salmonella may be present in fresh street vended fruit juices. The main microbial contaminants in fruit juices are Staphylococcus aureus, E. coli, Kebsiella, Vibrio cholera, Streptococcal spp. and Candida albicans . Other common bacterial contaminants of fruit juices are Pseudomonas aerogenosa, Proteus spp. and Salmonella typhi. Antibiotic-resistant bacteria are causing a great damage to public health. The number of new antibiotics being developed is limited compared to increasing frequencies of bacterial resistance. The need of the hour is to develop alternative antimicrobial strategies. The presence of cenamic acid, antioxidant agent and flavonoids is responsible for antibacterial potential of honey . Honey has been used to treat infections since ancient Egyptians and Greeks, but only recently scientists have proved its ability to inhibit bacterial growth . It has been investigated that there may exist marked differences in inhibitory activity of honey depending on its geographical origin and floral source . The main objective of this study was to calculate total viable count, staphylococcal count, coliform count, isolation and identification of bacteria from un-pasteurized packed fruit juices to assess their quality and to determine antibacterial activity of honey samples against isolated bacteria. Unpasteurized packed fruit juice samples (n=60) were purchased from street vendors in Lahore city. The samples of fruit juices were examined in Bacteriology Laboratory, Department of Microbiology, University of Veterinary and Animal Sciences, Lahore. Un-pasteurized fruit juice samples procured from retail shops were analyzed for total viable counts (TVC), total staphylococcal counts (TSC), total coliform counts (TCC) and Salmonella-Shigella detection. Spread plate method was used for isolation and enumeration of bacteria from fruit juice samples. Ten-fold serial dilutions of homogenized suspension were prepared aseptically in Laminar flow by transferring 1 mL of each of fruit juice sample into 9 mL of sterile phosphate buffered saline tubes separately. Bacterial isolation and enumeration was done as described in earlier studies [13, 14] at selective media including nutrient agar for total viable counts , Staph 110 agar for staphylococcal counts and MacConkey agar for coliform counts. Inoculated plates were incubated at standard time-temperature combination . After overnight incubation colonies were counted and colony forming units per milliliter (CFU/mL) were determined. A total of five samples of various brands honey (Al-Nahal Natural Honey, Al-Shifa Natural Honey, Marhaba Honey, Islamic Shahad and Langnese Honey) were collected from market. The honey is produced by different companies on commercial scale and available in market. Some brands use wild bees while others produce honey using house bees. In subcontinent, at least four Apis species are found, i.e. Apis dorsata, Apis cerana, Apis florae and Apis andreniformis. Moreover, for large scale natural honey production the Apis Mellifera bees imported from Europe are widely used in honey farms. Samples were stored at (23-25°C) in dark place. To determine antibacterial potential, honey samples were used undiluted and at 75, 50, and 25% dilution. Antibacterial activity was tested for all bacterial isolates. Disc diffusion method  was used according to National Committee for Clinical Laboratory Standards. Filter paper discs were prepared and poured in 25 µl of each honey dilution and Streptomycin (Positive control). The cultures of the test organism were streaked on Nutrient agar plates using a sterile cotton swab. The discs were placed on the plates and incubated at 37˚C for 24 hrs. The diameters of zones of inhibition obtained were measured according to CLSI . Data obtained for bacterial load was tabulated using Microsoft Excel (MS Excel 2010, Microsoft Corporation). Statistical analyses were done using Statistical Package for the Social Sciences (SPSS version 16.0). Values were expressed as log10 CFU/ml. Appropriate test statistics one way ANOVA using Duncan Multiple Range (DMR) test were used. Total Viable counts (TVC): Total viable count (TVC) is a measure of microbial quality of fruit juices. Presence of microbes in high numbers (TVC ˃4 log10 CFU/ml) is responsible for the spoilage of fruit juices (Gulf standards, (2000) and Codex standards, (2005). Mean TVCs in fruit juice samples vary non-significantly with the standard permissible counts (p˂0.05). Mean TVCs in all fruit juice samples (6.80±1.91 log10 CFU/ml) were greater than permissible limits (Table 1). In the present study, 66.66% of samples had TVC more than 4 log10 CFU/ml which indicates highly contaminated fruit juices. Bacterial load from fruit juice samples as represented by mean log10 CFU/ml ± SD. Staphylococcal counts (SC): Microbial quality of fruit juices is related to staphylococcal counts. Presence of staphylococci in high numbers (SC ˃3 log10 CFU/ml) is a health hazard as they cause spoilage of fruit juices and food borne diseases (Gulf standards, (2000) and Codex standards, (2005). Mean Staphylococcal counts in fruit juice samples vary non-significantly with the standard permissible counts (p˂0.05). Mean SC in all fruit juice samples (5.45±1.06 log10 CFU/ml) were greater than permissible limits (Table 1). In the present study, 51.66% of samples had SC more than 3 log10 CFU/ml. Coliform counts (CC): Coliforms are considered as indicators of quality. Presence of coliforms in high numbers (CC ˃2 log10 CFU/ml) is health hazard causing spoilage of fruit juices and food borne diseases. Gulf standards, (2000) and Codex standards, (2005), Coliform counts in fruit juice samples vary non-significantly with the standard permissible counts (p˂0.05). Mean CC in all fruit juice samples (3.25±1.25 log10 CFU/ml) were greater than permissible limits (Table 1). In the present study, 46.66% of samples had CC more than 2 log10 CFU/ml. A total of 10 (9.09%) Bacillus alvei, 22 (20%) Bacillus polymyxa, 19 (17.27%) Bacillus subtilis, 17 (15.45%) Staphylococcus aureus, 9 (8.18%) Pseudomonas aeruginosa, 14 (12.72%) Klebsiella pneumonia, 6 (5.45%) Enterobecter and 13 (11.81%) Escherichia coli isolates were purified (Fig. 1). Prevalence of bacterial isolates among unpasteurized fruit juices. Every dilution of each honey sample was tested against bacteria isolated from fruit juices such as Bacillus alvei, Bacillus subtilis, Bacillus polymyxa, Staphylococcus aureus, Klebsiella pneumonia, Pseudomonas aeruginosa, Enterobecter and Escherichia coli. All five different types of honey samples used in this study showed antibacterial activity against B. alvei, B. polymyxa, B. subtilis and S. aureus and no activity was found against P. aeruginosa, K. pneumonia, Enterobecter and E. coli. Islamic Shahad samples were found more effective as its lower dilutions showed antibacterial activity against most bacterial isolates and it might be due to purity of this brand of honey. Streptomycin was used positive control and all the bacterial isolates showed zones of inhibition against this antibiotic (Table 2-6). It was observed that 100% Al-Nahal Natural Honey showed maximum antibacterial activity against B. alvei, B. polymyxa, B. subtilis and S. aureus. B. polymyxa was susceptible against 25% dilution and B. subtilis and S. aureus were susceptible against 25% and 50% dilutions of honey. No activity was found against P. aeruginosa, K. pneumonia,Enterobecter and E. coli by any dilution of Al-Nahal Natural Honey (Table 2). Al-Shifa Natural Honey samples showed antibacterial activity against B. alvei, B. polymyxa, B. subtilis and S. aureus at 100% and 75% dilution. No activity was found against other bacteria (Table 3). It was observed that 100% Marhaba Honey showed antibacterial activity against B. alvei, B. polymyxa, B. subtilis and S. aureus and 75% dilution was active against B. polymyxa and S. aureus. No activity was found against other bacteria (Table 4). Islamic Shahad samples showed antibacterial activity against B. alvei, B. polymyxa, B. subtilis and S. aureus at 100%, 75% and 50% dilution. 25% dilution was active against B. polymyxa and B. subtilis. No activity was found against other bacteria (Table 5). It was observed that 100% and 75 % Langese Honey showed antibacterial activity against B. alvei, B. polymyxa, B. subtilis and S. aureus and 50% dilution was active against St. aureus. No activity was found against other bacteria (Table 6). Antibacterial activity of Al-Nahal Natural honey against bacterial isolates. Data are shown as mean zone of inhibition (mm2) ± SD. Antibacterial activity of Al-Shifa Natural honey against bacterial isolates. Data are shown as mean zone of inhibition (mm2) ± SD. Antibacterial activity of Marhaba honey against bacterial isolates. Data are shown as mean zone of inhibition (mm2) ± SD. 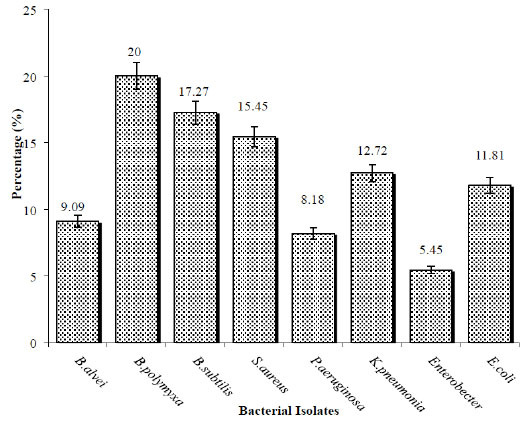 Antibacterial activity of Islamic Shahad against bacterial isolates. Data are shown as mean zone of inhibition (mm2) ± SD. Antibacterial activity of Langnese honey against bacterial isolates. Data are shown as mean zone of inhibition (mm2) ± SD. The bacterial count was low for some of the unpasteurized fruit juices and comparatively higher for some others. Higher levels of total viable counts (TVCs) in fruit juices were in accordance with the previous studies [5, 18-21]. The relatively higher bacterial counts were due to poor hygienic conditions and cause food spoilage and food borne illnesses. These findings about the bacterial load were against the findings of Tasnim et al. , who reported the bacterial counts of fruit juices within the standard limits. Higher levels of staphylococcal counts (SCs) in fruit juices were in accordance with the previous studies [21, 23], who have also reported significant levels of staphylococcal counts in fruit juices. Higher levels of staphylococcal counts (CCs) in fruit juices were in accordance with the previous studies of Rashed et al. , who reported the coliform count of 3.6 x 104 CFU/ml in fruit juices. These RESULTS suggested unsatisfactory hygienic practices during the preparation of these beverages. The RESULTS are according to previous findings [14, 18, 23]. It suggests that although most of the microbes do not survive low pH of juices and processing methods also kill most of the microbes but certain spores of Bacillus spp. survive and pose a serious threat to the consumers. It was suggested that quality of fruit juices should be monitored on regular basis to avoid any future outbreaks . The present study revealed antibacterial activity of different honey samples against gram positive bacteria at various concentrations and no activity was found against gram negative bacteria. Various studies had showed antibacterial activity of honey samples against various bacteria [24-26], which indicated that honey can be used as an alternative to antibiotics to treat various infections. In the present study, honey samples showed antibacterial activity in undiluted, 75 and 50% but start to decrease with decreasing the dilution percentage particularly against B. alvei, B. polymyxa, B. subtilis and S. aureus. The range of antimicrobial activity of honey has been reported from concentrations of 3% to 50% and higher according to many investigators [12, 27]. Antibacterial activity is influenced by the concentration of honey , the higher concentrations provoke its usefulness as an antibacterial agent. The antimicrobial activity of honey has been shown to range from concentrations < 3 % to 50 % and higher by French et al. . It has been shown that the bactericidal effect of honey is influenced by its concentration and the nature of the bacteria . Honey has very good inhibitory potential against E. coli, Shigella and Salmonella . Various factors are responsible for variation of antimicrobial potency among the different honeys that include its seasonal, geographical and botanical source as well as harvesting, processing and storage conditions . Honey contains 80% sugars, mainly glucose and fructose and some sucrose and maltose, and less than 18% water. Osmotic stress caused by high concentration of sugars and low moisture content causes prevents spoilage of honey by microorganisms. At higher dilutions, compounds other than sugar are responsible for the antibacterial activity. In the 1960s, H2O2 was identified as a major antibacterial compound in honey which is produced by the enzyme glucose oxidase from glucose . However, various honeys have shown antibacterial activity due to nonperoxide components. Recently, methylglyoxal and bee defensin-1 have been identified in honey which are antibacterial compounds. The contribution of the low pH (generally between 3.2 and 4.5) for the antibacterial activity of honey has been shown . In addition, there are clear indications for the presence of additional honey antibacterial compounds of which the identity remains to be elucidated. All the fruit juices sold on roadside were found highly contaminated with pathogenic bacteria. Lack of pasteurization is one of the major factors responsible for contamination of fruit juices. These organisms should be tested at specific control points to attain a better quality control. The best methods for prevention of contamination include constant surveillance and good manufacturing practice . Therefore, it is suggested that these juices should be monitored periodically in food laboratories for quality and human consumption. As an alternative honey can be mixed with the fruit juices as flavor or as sweetener so that antibacterial properties of honey may preserve the juices from contaminants. Some honey milk products such as pasteurized and homogenized sweetened with honey for long time storage e.g. yoghourt with honey is found in industrial sector . The use of honey in the industrial non-alcoholic beverage industry is relatively recent and expanded in 1990. Over 40 new honey drinks were introduced in Japan and in many fruit juices; honey is added as flavoring and sweetener. In apple juice, it is also used to classify fruit juice . In the light of prevalent microbiological standards for fruit juices, it is suggested that un-pasteurized packed fruit juices are the potential sources for common food borne diseases in the region. Microbial resistance against antibiotics is another emerging food safety issue and may provoke the health related issues in Pakistan. A precise and well defined monitoring and surveillance system needs to be implemented on urgent grounds to address the food safety in Pakistan. The study showed that certain organisms are sensitive to honey and it could be used as an alternative to antibiotics against certain bacteria. Therefore, there is need to investigate possible use of honey for therapies of bacterial infections by characterizing the active components of honey extracts. The authors are grateful to Professor Aftab Ahmad Anjum, Department of Microbiology, University of Veterinary and Animal Sciences, Lahore for providing materials to carry out this research. Codex Stan. Codex general standard for fruit juices and nectars. Codex Stan www.codexalimentarius.net/ 2005; 247: 1--19. Fawole MO, Osho BA. Laboratory manual of Microbiology. Spectrum Books LMD 2002; pp. 6-45. Minich DM, Bland JS. Acid-alkaline balance: role in chronic disease and detoxification. Altern Ther Health Med 2007; 13(4): 62-5. Suaad SA, Eman AH. Microbial growth and chemical analysis of mineral contents in bottled fruit juices and drinks in Riyadh, Saudi Arabia. Res J Microbiol 2008; 3: 319-25. Bagde NI, Tumane PM. Studies on microbial flora of fruit juices and cold drinks. Asiatic J Biotech Resources 2011; 2: 454-60. Akhtar S, Riaz M, Ismail T, et al. Microbiological Safety of street vended fresh fruit juices, drinks and conventional blends in Multan-Pakistan. Pak J Agri Sci 2013; 50: 255-60. Mahale DP, Khade RG, Vaidya VK. Microbiological analysis of street vended fruit juices from Mumbai city, India. Int J Food Safety 2008; 10: 31-4. Nicolas B, Razack BA, Yollande I, et al. Street-vended foods improvement: contamination mechanisms and application of food safety objective strategy: critical review. Pak J Nutri 2007; 6: 1-10. Ukwo SP, Ndaeyo NU, Udoh EJ. Microbiological quality and safety evaluation of fresh juices and edible ice sold in uyo metropolis, south-south, Nigeria. Int J Food Safety 2011; 13: 374-8. Rahman MM, Richardson A, Sofian-Azirun M. Antibacterial activity of propolis and honey against Staphylococcus aureus and Escherichia coli. Afr J Microbiol Res 2010; 4: 1872-8. Lotfi A. Use of honey as a medicinal product in wound dressing (human and animal studies): a review. Res J Biol Sci 2008; 3: 136-40. Lusby PE, Coombes AL, Wilkinson JM. Bactericidal activity of different honeys against pathogenic bacteria. Arch Med Res 2005; 36(5): 464-7. Prescott LM, Harley JP, Kleen DA. Microbiology. 5th ed. New York: McGraw Hill 2002; pp. 965-72. Ghenghesh KS, Belhaj K, El-Amin WB, et al. Microbiological quality of fruit juices sold in Tripoli-Libya. Food Contr 2005; 16: 855-8. USFDA. Bacteriological analytical manual online. Available at: http://www.fda.gov/Food/ScienceResearch/LaboratoryMethods/BacteriologicalAnalytical ManualBAM/default.htm 2001. Bauer AW, Kirby WM, Sherris JC, Turck M. Antibiotic susceptibility testing by a standardized single disk method. Am J Clin Pathol 1966; 45(4): 493-6. CLSI. Performance standards for antimicrobial susceptibility testing. Clinical and Laboratory Standards Institute. 16th Informational Supplement M100-S16; 2006; Wayne, PA.
 Rahman T, Hasan S, Noor R. An assessment of microbiological quality of some commercially packed and fresh fruit juices available in dhaka city: a comprehensive study. Stan J Microbiol 2011; 1: 13-8. Lewis JE, Thompson P, Rao B, et al. Human bacteria in street vended fruit juices in India. Int J Food Safety 2006; 8: 35-8. Durgesh PM, Ranjana GK, Varsha KV. Microbiological analysis of street vended fruit juices from Mumbai city, India. Int J Food Safety 2008; 10: 31-4. Rashed MN, Aftab U, Azizul MH, et al. Microbiological study of vender and packed fruit juices locally available in Dhaka city, Bangladesh. Int Food Res J 2013; 20: 1011-5. Tasnim F Jr, Anwar Hossain M, Kamal Hossain M, Lopa D, Formuzul Haque KM. Quality assessment of industrially processed fruit juices available in dhaka city, bangladesh. Malays J Nutr 2010; 16(3): 431-8. Ahmed MS, Nasreen T, Feroza B, et al. Microbiological quality of local market vended freshly squeezed fruit juices in Dhaka city, Bangladesh. Bangladesh J Sci Ind Res 2009; 44: 421-4. Badawy OF, Shafii SS, Tharwat EE, Kamal AM. Antibacterial activity of bee honey and its therapeutic usefulness against Escherichia coli O157:H7 and Salmonella typhimurium infection. Rev - Off Int Epizoot 2004; 23(3): 1011-22. Gomashe AV, Narad MV, Gulhane P. In vitro Assessment of the antimicrobial potential of honey against enteric pathogens. Int Res J Sci Engin 2014; 2: 153-7. Hamouda HM, Marzouk DS. Antibacterial activity of egyptian honey from different sources. Int J Microbiol Res 2011; 2: 149-55. Wilkinson JM, Cavanagh HM. Antibacterial activity of 13 honeys against Escherichia coli and Pseudomonas aeruginosa. J Med Food 2005; 8(1): 100-3. French VM, Cooper RA, Molan PC. The antibacterial activity of honey against coagulase-negative staphylococci. J Antimicrob Chemother 2005; 56(1): 228-31. Basualdo C, Sgroy V, Finola MS, Marioli JM. Comparison of the antibacterial activity of honey from different provenance against bacteria usually isolated from skin wounds. Vet Microbiol 2007; 124(3-4): 375-81. Zumla A, Lulat A. Honey--a remedy rediscovered. J R Soc Med 1989; 82(7): 384-5. Molan PC, Cooper RA. Honey and sugar as a dressing for wounds and ulcers. Trop Doct 2000; 30(4): 249-50. Molan PC. The antibacterial activity of honey.The nature of the antibacterial activity. Bee World 1992; 73: 5-28. Kwakman PH, te Velde AA, de Boer L, Speijer D, Vandenbroucke-Grauls CM, Zaat SA. How honey kills bacteria. FASEB J 2010; 24(7): 2576-82. Juhaniakova L, Kacaniova M, Petrova J, et al. Microbiological quality of confectionary products. J Micro Biotech Food Sci 2013; 2: 1244-51. Ebisu T, Maeda N, Matsubara H, et al. Honey powder. Composition as additives for foods and Pharmaceuticals. Japanese Patient Number 1988; 63: 157-943. Spanish Dairy Corporation Preparation of yoghurt with honey. International Symposium on Apitherapy,; 1975; Madrial. 55-6.